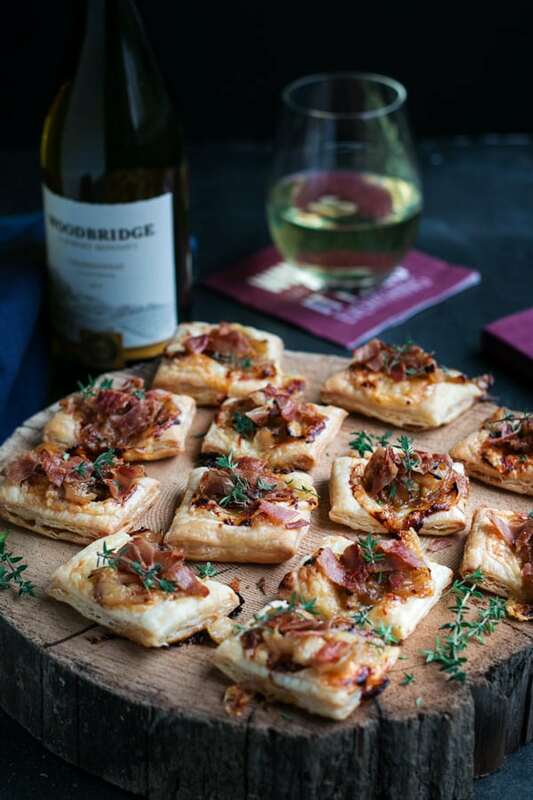 These puff pastry tartlets are so easy to make and the combo of wine, caramelized onions, roasted garlic, aged cheddar and prosciutto is insanely delicious! Elegant enough to serve as a fancy hors d’oeuvre or for a holiday party, but easy enough to make for any occasion. It’s super easy to double this recipe and trust us, this is a good idea! They will get gobbled up quick. These bite sized beauties are perfect for your upcoming holiday parties. They are so elegant and no one will know that they are so easy to make! Plus, its just as easy to make one batch as it is to make two or three so even if you are expecting a big crowd, you can easily serve this puff pastry appetizer. What is a tartlet anyways? A tartlet is just a mini tart. In this case, its a bite sized puff pastry tart. Who doesn’t love a bite sized tart?! Just a little note about the puff pastry sheets. You can find puff pastry in almost every grocery store, but there are sometimes two kinds. It comes in sheets or in thick squares. If you can find the sheets, get those as they are a lot easier than rolling out the squares, but in a pinch, we have made this recipe by rolling out the squares ourselves too. Buying puff pastry pre-made saves a lot of work, but if you are ambitious and want to try to make it yourself, here is a link to try a try this link. For a more traditional recipe for puff pastry, try this link. Caramelized onions are the star of these puff pastry tartlets. 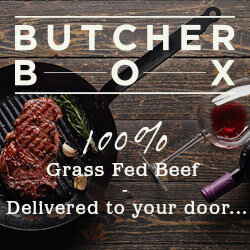 They are always delicious, but made with wine, they are even better. They are also very easy to make, they just take a little time. You start by slicing the onions into thin (but not too thin) slices. About 1/3 inch thick. You can leave them like this or cut them in half so they aren’t too long. This is what we do. Heat a skillet on medium-low and add 1 tbsp of butter to the skillet and then add the onions. Stir the onions around to get coated in the melted butter. Sprinkle a little salt on top. Let the onions start to get a little browned and then add 1/8 cup of wine to the skillet and stir. Then let the onions cook until they start to brown again. Add another 1/8 cup of wine and repeat until the onions are nicely browned and caramelized. After you have added the full cup of wine, you might need to turn down the heat a little so they don’t get too browned. See, easy! And that’s the hardest part. Roasted garlic is also very easy to make. Simply cut the top off a head of garlic and plop it down on some tin foil or in a small oven proof baking vessel with a lid. Drizzle some olive oil on top and sprinkle with salt. wrap up the garlic in the foil or cover and bake at 375 degrees for about 40 mins or until the garlic is nice and browned and soft. You can easily make your roasted garlic in the oven, however we love our smaller toaster oven for making things like roasted garlic. It takes a lot less time to heat up and its a lot smaller so it uses less energy. I feel like the garlic roasts faster in my toaster oven too. Debbie has this one and I have this one. I actually use my toaster oven a LOT and I know Debbie does too. They make the best french fries ever! 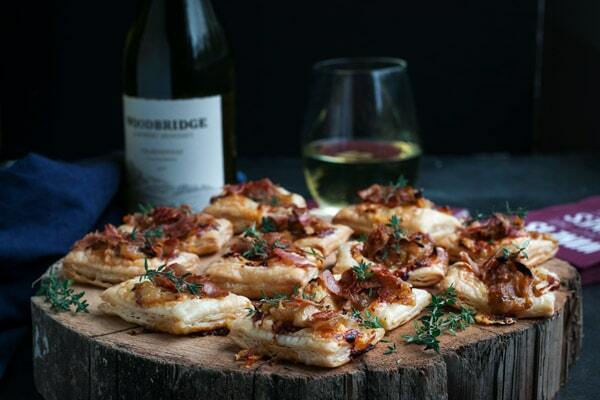 We used Chardonnay from Woodbridge by Robert Mondavi Wines for the wine caramelized onions. 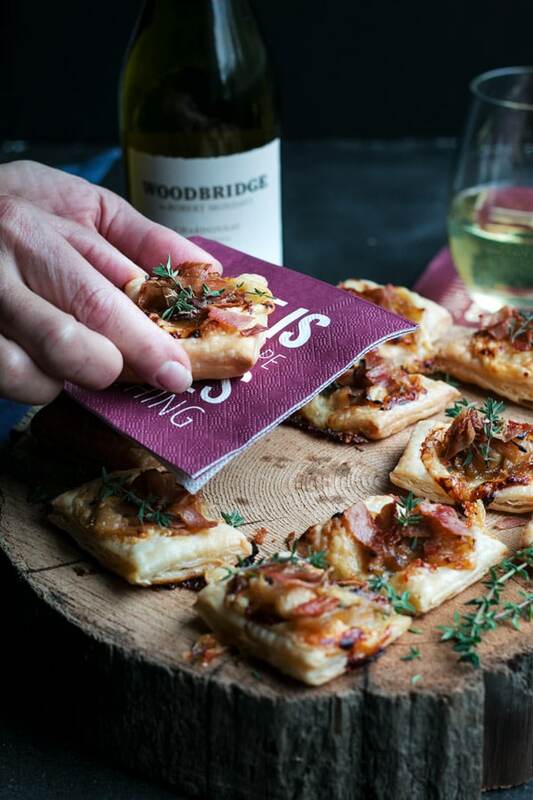 Woodbridge by Robert Mondavi Classic wines feature bright fruit flavours and smooth finishes made to complement food. The apple, peach, and warm oak flavors of this clean and crisp yet silky Chardonnay pair perfectly with the hearty flavours in our puff pastry tartlets. 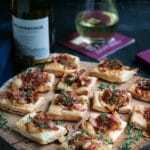 We enjoyed a glass (or two) of this Chardonnay while we made these tarts. I have to say that normally I am not a Chardonnay girl, but I found this one to be really smooth and enjoyable to drink. You could use any white wine you have, but we encourage you to give this one a shot. Its very good! You can find Chardonnay from Woodbridge by Robert Mondavi Wines in the California section of most liquor stores. Go ahead and check out their website for more recipes, serving tips and check out the wine pairing app that provides recommendations of what wine to serve with your food. When the onions are close to done, add the diced pears, roasted garlic and thyme. Cook until the pears are slightly soft. Remove from the heat and cool slightly. Unroll your puff pastry sheet and cut it into small squares. Even though the sheet is rectangle, it should cut into 16 squares pretty easily. For help cutting your squares, line up 4 pieces of the cheese on one edge, cut the 4 strips and then line up the cheese on the other side and cute again. We found this made it easier. If you have just the big square of puff pastry then roll it out with a rolling pin to a rectangle that’s about 8 x 11 or so. Place the cut sheet of pastry on a baking tray and then spread the squares out a bit. You don’t have to do this, but we found the pastry will puff up better with some room in between each square. Cut the rest of your cheese. You want about 1/8 inch square chunks of cheese so that they fit the puff pastry squares, but with some pastry showing around the cheese. Like in the first picture above. Add a generous teaspoon of onion mixture to each square and then throw in the oven to bake for 15 mins at 400 degrees. While the tartlets are baking, crisp up 2 or 3 sheets of prosciutto in a skillet on medium heat. These will just take about 20 seconds on each side. Then cool them and crumble them up into small pieces. You can chop them with a knife too if that works better. When the tartlets come out of the oven, top them right away with the crumbled prosciutto and also with some fresh thyme. Serve these hot straight out of the oven or at room temperature. Both are great! Can these caramelized onion tartlets be made ahead of time? Definitely! They can be made ahead of time in two ways. You can make them completely ahead and just not bake them. Then cover them and store them in the fridge for up to 3 or 4 days. Then bake and serve. You can make them and bake them and then store them in the fridge for a couple days. Then when you want to serve them, reheat them for 8 mins in a 350 degree oven. When Debbie and I make these at our homes, we will usually make them and store them in the fridge without baking until we’re ready to serve them. When we make them to take to a party, we often bake them at home first and then reheat them at the party. Or serve them at room temperature if there is no way to reheat them. Can you freeze these puff pastry tarts? If you’ve tried these caramelized onion puff pastry tartlets then don’t forget to rate the recipe and let us know how it turned out in the comments below. We love hearing from you! 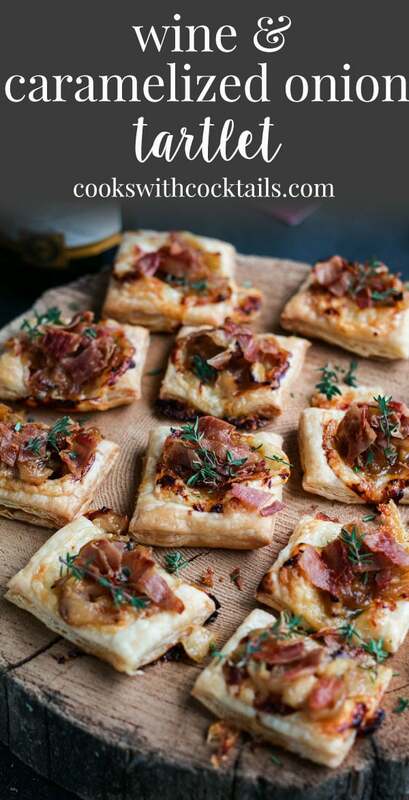 These puff pastry tartlets are so easy to make and the combo of wine, caramelized onions, roasted garlic, aged cheddar and prosciutto is insanely delicious! Elegant enough to serve at a fancy party, but easy enough for any occasion. Cut the top off a head of garlic and plop it down on some tin foil or in a small oven proof baking vessel with a lid. Drizzle some olive oil on top and sprinkle with salt. wrap up the garlic in the foil or cover and bake at 375 degrees for about 40 mins or until the garlic is nice and browned and soft. Slice the onions into thin (but not too thin) slices. About 1/3 inch thick. You can leave them like this or cut them in half so they aren't too long. This is what we do. After you have added the full cup of wine, you might need to turn down the heat a little so they don't get too browned. When the onions are close to done, add the diced pears, roasted garlic and thyme. Cook until the pears are slightly soft. Remove from the heat and cool slightly. Place the cut sheet of pastry on a baking tray and then spread the squares out a bit. You don't have to do this, but we found the pastry will puff up better with some room in between each square. Cut the rest of your cheese. You want about 1/8 inch thick square chunks of cheese so that they fit the puff pastry squares, but with some pastry showing around the cheese. Like in the first picture above. Add a generous teaspoon of onion mixture to each square and then throw in the oven to bake for 15 mins at 400 degrees. What an absolutely divine appetizer! These are just perfect for parties. Also I must say that I would have had a difficult time not consuming a lot of these before party time. They are just too tempting. 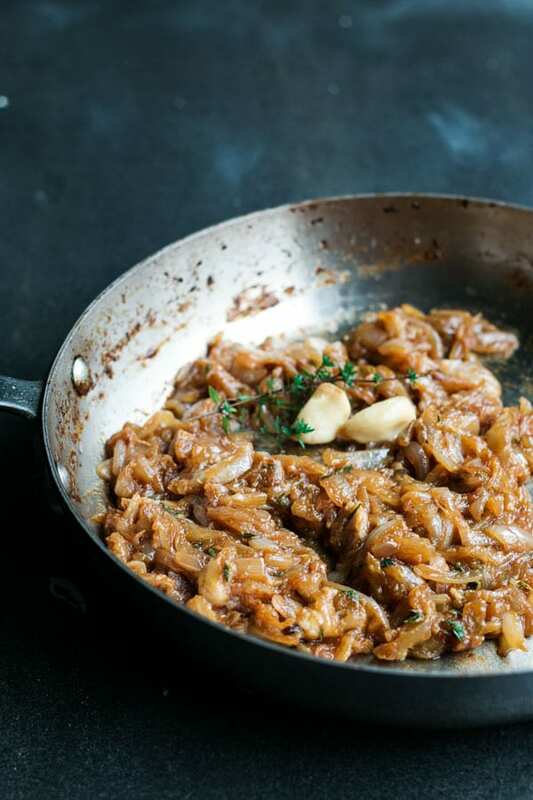 I love caramelized onions and with the addition of wine, they may not make it to the tartlets 😉 Sounds like a delicious recipe. Lol! I have to make extra on purpose so I have some for sampling! Hello, I am making these now and everything is coming together great! But, I don’t see where/how to add the cinnamon? So sorry, the cinnamon stick was accidentally left in when we revamped the recipe. You don’t need it. Ive updated the recipe now.